I consider myself a team player. A few years ago when our district announced that the Learning Management System they were supporting was going to be Canvas LMS I stopped using Schoology and started learning as much as I could about Canvas LMS. Right away I could see the potential, there was a ton of back end data that Canvas was collecting, it was designed with mastery and personalized learning in mind, and you could complete customizations of your pages with just a tiny bit of knowledge of basic HTML. So I committed to using Canvas as my class website and used it to host all the blended assignments I was creating. I spent hours reading the incredible Canvas LMS community learning all the things it could do that could potentially make my teaching more engaging, more personalized, and more about meeting the needs of my students. You see, Canvas does have some remarkable features - you can create quizzes that pull from a question bank so no two students have the same quiz, you can create mastery paths so students are directed what to do next based on how they do on certain tasks, you can even toggle between a mastery grade book and a traditional grade book and apply proficiency scales and rubrics to every assignment. Canvas is incredibly powerful, I honestly think it has the most potential of any LMS out there because of all the things it can do but I don't think I'll ever use Canvas again. It's important for you to know that I spent hours of my free time finding all the remarkable things Canvas can do. I attended every PD that was offered and I spent several semesters trying to use it with my classes and while the things it can do are really groundbreaking and incredible, to use them effectively and in a meaningful way requires an enormous amount of work from the person creating the course. And this is where I think maybe some decisions makers have been led astray. Canvas can do everything you want it to, but you have to build it all yourself. All those rubrics, all those mastery paths, all those test banks you have to create from scratch and build and map out on your own. And while right now you might be thinking "but don't you already have to plan your units and lessons on your own? Don't you have to design assessments? How is this different than normal teaching?" The difference is you aren't just building a meaningful lesson, you have to learn and understand how all these intricate components of Canvas operate and the stuff that makes Canvas groundbreaking is the stuff that takes the most amount of time and energy to build. Canvas does offer a place called the "Commons" where you can pull resources from other teachers but if you don't have a teacher you know and trust to pull from you then need to go through every item you brought into your class to make sure it aligns with your standards and practices and often what I have pulled has been more work than it was worth. I think the idea behind Canvas was that teams of teachers would work together to build the tougher parts of Canvas, the test banks, the mastery paths, the rubrics, and then share with each other. But typically, that is not how new tech initiatives are adopted at school sites. Usually, there are a few people who try it out on their own at first and then slowly more teachers adopt as they see how the tool works and can benefit students and teachers. The thing is, even after the countless hours I have put into Canvas, I can't show my colleagues how truly meaningful and powerful Canvas could be because I do not have the time to hand type the proficiency scales for every standard I teach, I don't have the time to create and develop all the mastery paths, and I don't have the time or resources to build out the test banks. And if I am not going to take the time to do that work now, I won't really be able to sell other teachers on doing it themselves, even if they could do it as a team. 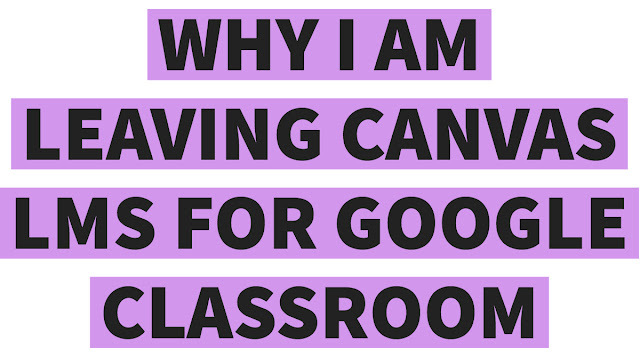 The really amazing stuff Canvas can do is incredibly time-consuming to create and so for the average teacher, it is a waste of time and energy when Google Classroom offers you the solution by seamlessly integrating with outside tools that can do all those things and more. For example, why would I spend time creating test banks for quizzes on Canvas when I can connect my Google Classroom to my Quizizz account and build quizzes from a massive library of teacher-created questions that I can easily search? Why am I spending the time creating an assignment on Canvas that is a video with questions when I can use Edpuzzle, synch it to Google Classroom, and it will automatically score any multiple choice questions I create? And why am I wasting my time typing rubrics and proficiency scales for each standard into Canvas when I can just add that same type of feedback to the comment bank on Google Classroom through a simple copy/paste? Almost every educational website, app, or tool of value that is out there right now directly syncs and connects with Google Classroom. While Canvas has "integrations" it rarely pulls grades or data from outside apps or sites into Canvas resulting in more work for the teacher. Google Classroom pulls the scores or grades from most sites it works with while with so you can see it all in one place, with Canvas you have to toggle back and forth between grade books or import CSV files to enter that data. Google Classroom has an incredibly simple design that is easy for students and teachers to navigate and understand. It also has features that are essential to effective teaching practices and allow teachers to increase communication and feedback to students. One of the biggest features is the ability to push a copy of an assignment to each student and see in real time what the student is doing and give them feedback while they are still working. Canvas does offer this option now as well but like most things, where Google Classroom this takes just one click of a button, Canvas requires five steps to get there. I absolutely believe Canvas is the more powerful LMS but it is useless to teachers without support. While the learning community and support team from Canvas are outstanding, they can't build the courses for you and unless districts are going to pay for the hours upon hours it takes to fully build courses that can truly utilize those features then it just isn't worth it. Now, if you are one of those remarkable teachers who has spent the time and energy to build a course that uses the incredible features Canvas has to offer I admire you and am kind of envious of your skill level and dedication. At the end of the day, it honestly doesn't matter which LMS you are using, you know your class and what works best for them, as a teacher you should have the autonomy to make that choice and at the teacher level there is no right or wrong when deciding on your LMS. What I hope comes out of my writing this is an understanding that while some education technology out there is incredibly powerful and versatile the effort it takes a teacher to fully use that tool might not make it worth it. It doesn't matter if teachers have access to the most powerful learning system if the support and resources are not there to allow them to fully implement it. With Canvas, the support can't be limited to training teachers how it works because what teachers really need to implement it well is for there to be banks and databases for them to pull resources from. And that is the consistent problem I see with Canvas, it can really do it all but it takes endless hours to get it ready to do it all just for one class. When that responsibility is placed on the individual teachers' shoulders then it becomes nearly impossible for a teacher to effectively implement all Canvas has to offer. For me the choice is clear, Google Classroom has powerful features in a student-friendly design that is easy to navigate. It is a system that is quick and easy to learn and use. While it does not have all the options that Canvas does it instead offers the ability to seamlessly sync with other educational sites and apps that offer many of those things. With Google Classroom I can create a place that is easy for students to navigate, offers personalized learning experiences, and allows me to communicate and give feedback while students are working on assignments. As a teacher, it doesn't matter which one you pick. You know your students and their needs better than anyone and teachers should have a say in which LMS works best in their classroom. In the end, it is the teacher who has to build out the course, teach their students to navigate it, and interact with their students via the platform so to take away that choice from teachers is the same as dictating daily classroom procedures to every classroom on your campus. As decision makers, it matters which educational tools you push on your teachers. A tool might offer all the bells and whistles but what really needs to be discussed and understood is what is the cost of those bells and whistles for the teacher. How much time, work, and skill is required to fully implement what that tool is offering? You won't really know that without teachers in the room when these decisions are made because even if you were a teacher 15, 10, or 5 years ago if you aren't in a classroom right now, you don't know the challenges teachers integrating technology face. Very thoughtful! I have been considering making the switch to GC for many of the reasons you explained here. Great Services.i have some information for your blog. I have made the change from canvas to classroom. But I hate to re-make my quizzes. Is there a way to easily pull the questions from canvas without copy/pasting everything?